This July menu has been planned and recipes proposed but not yet tested and photographed. I am excited to try the recipes below and will be doing so next weekend. We are so quickly approaching the end of the month and I wanted to share this with you so that you might enjoy it when it suits your summer schedule. Once tested, I will add comments and photographs. Julie has had a rigorous travel and work schedule this summer (this is where she is now) but I am grateful that she has made time to get together to plan menus and chat around the table when she is home. She has already made a paella and will be posting her version in the coming weeks. 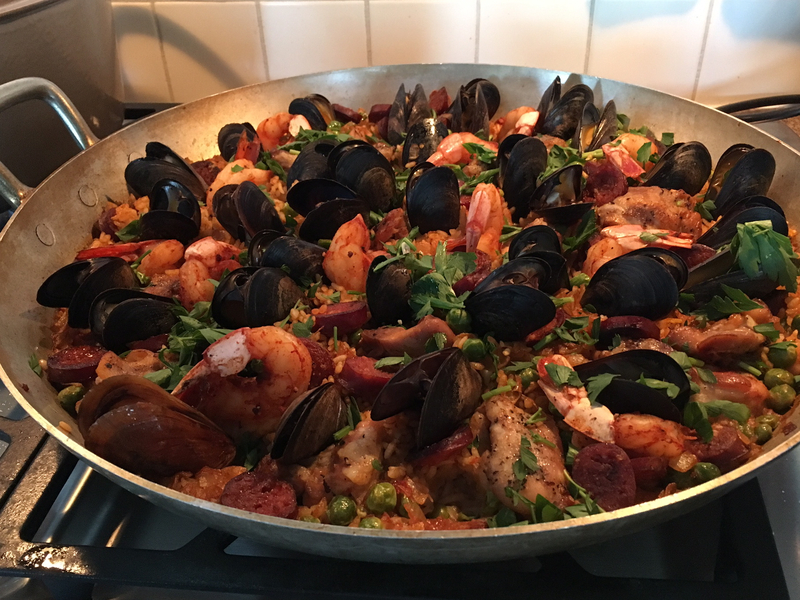 The idea to feature paella came from friend and blog-follower, Daphne, who commented last month and made reference to making this for a party. It struck Julie and me as an ideal summer dish that can feed many people and that can be eaten at room temperature if you like. This version of paella can be started in advance up to the point of adding the liquid, started on the stove and finished in the oven shortly before serving. While researching this menu, I found that there are many versions of paella, depending on region and local ingredients. Some cooks write that they make the entire dish on the barbecue, some in the oven and others half and half. Ingredients can be varied according to preference: omitting the chicken and sausage, adding more varieties of seafood, or substituting a different green vegetable such as peas for the beans. Regarding menu design, I liked the idea of making mostly Spanish dishes. The exception is the dessert since I wanted to use blueberries that are so gorgeous in the market now. I have inserted a link for the blueberry tart recipe which was first posted here almost 5 years ago. If you have made this tart before, you will notice that I have adjusted the sweetness of both the pastry and the filling by halving the sugar amounts. Note: This menu serves 6. This recipe is based on one in John Bishop’s Cooking at My Home, with these adjustments: I replaced green pepper with red pepper, reduced amount of olive oil from ⅔ cup to ⅓ cup, and used Sherry vinegar instead of red wine vinegar. Combine all ingredients in a blender and blend to a creamy soup consistency. Check seasoning. Pour into a glass container, cover and refrigerate until very well chilled. This soup improves in flavour so can be made a few days ahead. To serve, pour chilled soup into shot glasses or other small glasses. In a small saucepan, toast the fennel seeds until they start to brown and smell fragrant. Cool and then grind in a spice grinder or in a mortar and pestle until finely ground. Add salt and mix well. If you want a finer consistency, grind the salt with the ground fennel for a second or two. Place quail’s eggs in boiling water for 4 minutes. Drain, rinse under cold tap water and peel off shells. Cover and refrigerate until ready to serve. I cut the egg container in half lengthwise and used it as a serving dish for the eggs. Like the paella recipe below, I found this recipe on Chowhound.com as part of a Spanish menu. The recipe calls for Membrillo (quince paste) that is a typical Spanish pairing with Manchego cheese. Manchego is made in the La Mancha region of Spain from the milk of sheep of the manchega breed. Quince paste and Manchego can be purchased at most cheese shops. I plan to test and compare this pairing with grilled peaches which are so delicious in our markets now. Combine the garlic, vinegar, and salt in a medium bowl. Whisking constantly, add the olive oil in a steady stream until completely incorporated. Combine the watercress, almonds, and half of the cheese shavings in a large bowl. Drizzle the dressing over the salad and toss to coat. Go lightly and taste as you may not need all of the dressing. Divide the salad among 6 plates and garnish with the remaining cheese and the peaches or quince paste. For the peaches: Halve and pit the peaches, then brush with a little olive oil. Grill them just enough to mark them on the cut side. Cut each half in half again and reserve until ready to serve the salad. This can be done several hours before serving. If you do not want to grill them, you don’t need to, but the grilling brings out the taste of the fruit. I found the basis for this recipe at Chowhound.com. I have made some adjustments to it and below is my amended version. Core and halve the tomatoes. Grate the flesh side of each half on the large holes of a box grater set over a medium bowl, stopping when you get to the skin. Discard the skins. Set aside the tomato pulp and juice. In a small bowl, soak the saffron in hot water. Reserve. Place the shrimp in a medium bowl, add 1/4 teaspoon of the paprika, and season with salt and pepper. Toss to combine and refrigerate. Place the chicken in a medium bowl and season generously with salt and pepper; set aside. Place a 15-inch paella pan, or a large sauté pan, across two burners and heat over medium-high heat until hot, about 2 minutes. Add the chorizo to the pan and cook, stirring occasionally, until it has started to brown and the fat has rendered, about 2 to 3 minutes. Using tongs or a slotted spoon, transfer the sausage to a large bowl that is lined with paper towels. When fat is drained, remove paper towels and set aside. There should be a thin layer of rendered fat in the pan. If there’s not enough, add 1 to 2 tablespoons of olive oil. Add the seasoned chicken to the pan in a single layer and sear, stirring occasionally, until both sides are golden brown, about 6 minutes total. You will need to rotate the pan occasionally over the burners to evenly distribute the heat. Using tongs or a slotted spoon, transfer the chicken to the bowl with the chorizo and set aside. Reduce the heat to medium. Add the onion, season with salt and pepper, and cook, stirring occasionally, until softened, about 5 minutes. Add the garlic, and the remaining 3/4 teaspoon paprika, stir to combine and cook until fragrant, about 30 seconds. Add the reserved tomato pulp and juice and cook until the mixture has slightly darkened in color, scraping up any browned bits from the bottom of the pan, about 3 minutes. Add the rice and measured salt ( 1 teaspoon) and stir to coat in the tomato mixture. Stir in the beans. Heat the oven to 400°F and arrange a rack in the middle. Increase the heat on the stove to medium high. Add the broth and the saffron and liquid and stir to combine. Arrange the rice mixture in an even layer. Distribute the reserved chorizo and chicken over the rice, adding any accumulated juices from the bowl. (Do not stir the rice from this point on.) Bring to a lively simmer and continue to simmer, adjusting the heat as necessary and rotating the pan 90 degrees every few minutes, until the rice grains have swelled, most of the liquid has been absorbed, and the rice starts to make a crackling sound, about 12 minutes. This produces the crust on the rice that is an important feature of paella. Remove the pan from the heat. Arrange the reserved shrimp and the mussels (hinge-side down) in the rice, nestling them slightly. Place the pan in the oven and bake until the shellfish have opened, the shrimp are just cooked through, and the rice is tender but still al dente, about 10 to 12 minutes. Remove the pan from the oven and place on a wire rack. Cover with foil and let stand for 5 minutes. Before serving the paella, discard any unopened shellfish and sprinkle the dish with the parsley. Serve with the lemon wedges.